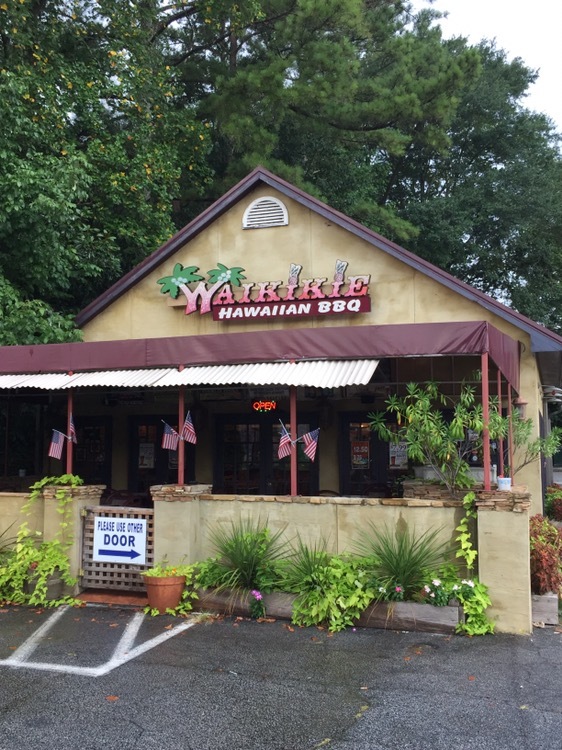 Several times over the last six or eight months, as I worked my way from North Druid Hills toward Virginia-Highlands, I passed by Waikikie Hawaiian Barbecue and thought to myself, “I need to try that.” But I didn’t ever get around to it. So on this Sunday afternoon, as we were roaming around and dinner approached, I started heading down Briarcliff. 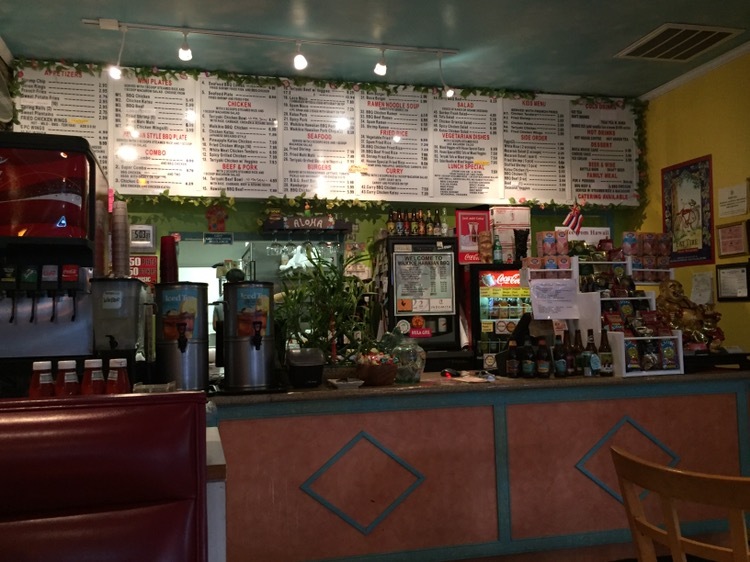 Walking in, we were immediately overwhelmed by the massive menu – that’s the menu on the wall over the counter. We stepped up and read our way through the sections – mini plates, Hawaiian barbecue plates, meat-based (or vegetarian) plates, ramen noodles, fried rice and curries. There are 53 plates, not counting mini-plates, kid meals, appetizers and desserts. That’s an expansive menu. 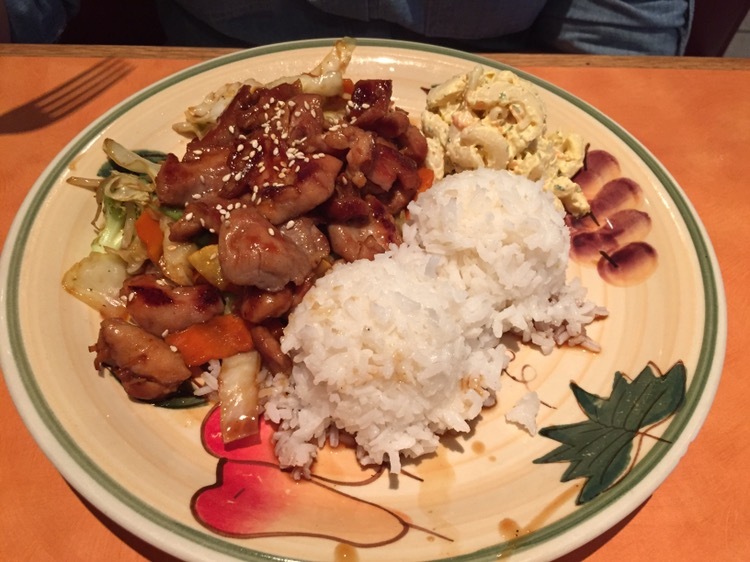 My beloved was looking for a “healthy” choice and she chose the teriyaki chicken plate. The chicken was grilled on a flattop grill, topped with teriyaki sauce and served with steamed vegetables and white rice. It was fine, but nothing spectacular. 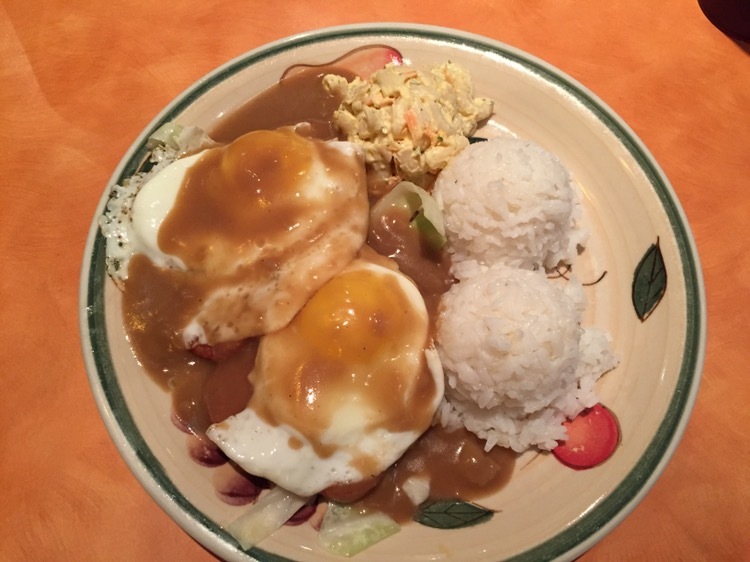 four slices of fried spam on top of cabbage, covered with two fried eggs, covered in brown gravy. It was served with white rice and macaroni salad. Yep – macaroni salad, just like my mom (and maybe yours) made in the 60s and 70s. The only thing missing was the shape – if only they had made it in the jello mold my mom used. If you don’t know, the islands of Hawaii eat more Spam per capita than any other state in the Union. But do fall behind Guam, as do most other people in the world – where they consume 16 cans of Spam per person, per year. Why do they call it Spam? Isn’t it pork shoulder and ham? Shouldn’t it be Psam? We ate a lot of Spam when I was a kid, often fried with scrambled eggs. I’m always interested to try another variation on it, and this seemed right up my alley. The Spam loco was good – mixing the fried egg, Spam, rice and brown gravy hit all the points for umami. In discussing it with my wife, she said the main issue she saw was that the Spam was wrong color – she prefers it fried to the edge of black. I’ll go back. Only 51 more things to try, though. Oh, yeah – there are daily specials, too. For what it’s worth, I didn’t spell the name of the restaurant wrong. They chose to add the “E” to Waikiki (the city name) to differentiate themselves. How does a person get in touch with you! Love your blog!